One of my favourite books growing up was James and the Giant Peach. My imagination soared high into the sky just as the Giant Peach did, aided by the Seagulls. Those very same imaginary thoughts were brought to life on the Sneddon stage by KickstArt. Audiences young and old were wowed by this spectacular production from the mystical lights to the fantastical Giant Peach. Roald Dahl’s James and the Giant Peach is magically transformed into this spectacle that dazzles audiences and transported us into the nostalgia of a fond childhood memory. This aesthetical brilliance is designed and directed by Greg King, well-known for his award-winning set designs, and his fine eye for visual splendour is evident in the costumes, the grey scaled set design with bursts of colour, the innovative uses of props and the magnificent puppets. The crooked house and its crooked content were cleverly designed into the set with hidden entrances and the use of a revolving Giant Peach. All of which is stunningly lit by the design genius of Tina Le Roux. Lighting played an enormous part in the show and was used to propel us out of our seats and into James’ world. The show is packed with great audience participation, as is most children’s theatre, but everyone in the audience was thrilled to bounce around a giant orange beach ball, be part of the crowd who gathered in awe of the Peach and pass letters out for James, who was played so sensitively by Bryan Hiles. 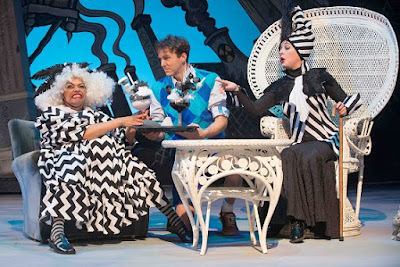 Peter Court, Nhlakanipho Manqele and Lyle Buxton offer stellar performances, but my pick of the night has to be shared by Belinda Henwood and Clare Mortimer who are sensational as the two evil aunts and then quickly change into Ladybug and Spider to wow us with their physically farcical presents and range of accents.